I really like what Alan Tsao is doing with his watch line and wanted to give him a shout out here. 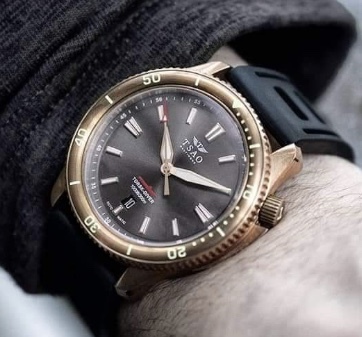 His upcoming TORSK dive watches offer many different variations (both case material and dial colors), solid specs and good value IMO. I have had a couple of conversations with him and he seems like a great guy and was very prompt and responsive to my inquiries. Re: Tsao TORSK Diver looks great! I like the original (Bremont) better. gonzomantis wrote: I like the original (Bremont) better. That was the first thing I said when I saw it some time back. Lol. That said, it's a good looking watch for sure. Went back and forth on it, Brice. Really like the blue as well. Holy cow, cool Todd ! Love these, and they are from Baltimore also !!! Seriously cannot choose a favorite. ..I mean they are all extraordinary really ! Man oh man, thanks a ton for the introduction !!! AtomicTom wrote: Holy cow, cool Todd ! Love these, and they are from Baltimore also !!! Man what is wrong with you? I really like these and had I not just bought the Glycine, would have given these some serious consideration. Case shape is great and unusual and the lume is excellent. Only minor aesthetic niggle is the gap between crown and crown guard, I would like to see that a bit closer. I'll be the last guy to bash homage watches, but you head the nail on the head with this comment. Does this case profile look familiar? I just can’t get excited about a micro brand watch these days unless it’s very unique or has some other significance.